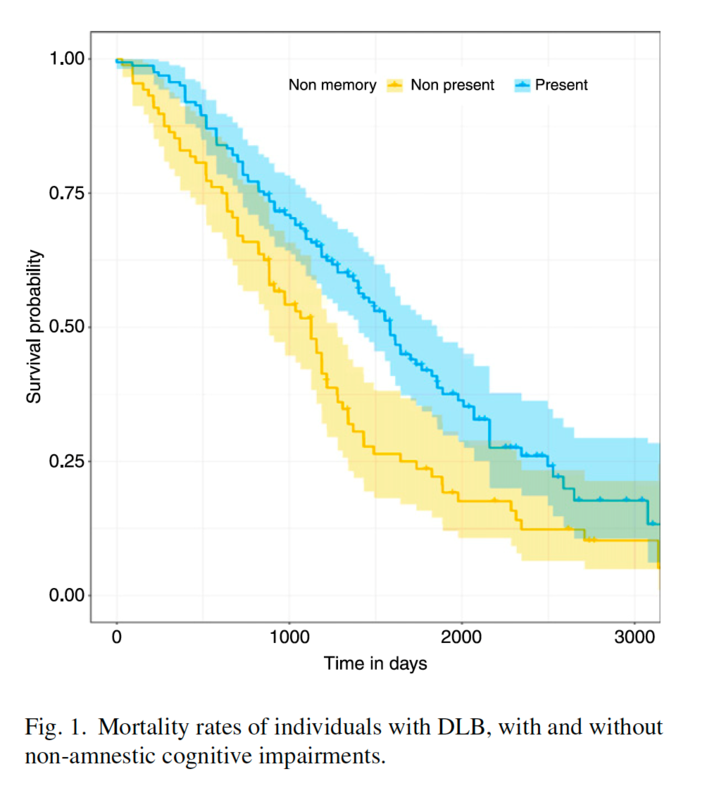 New research shows that survival times among individuals with Dementia with Lewy Bodies are markedly shorter (on average 3 years) compared to individuals with Alzheimer’s disease. Dementia with Lewy bodies (DLB), also known as Lewy body dementia, is a common type of dementia estimated to affect more than 100,000 people in the UK. Individuals with DLB experience a range of complaints, including memory loss, hallucinations and low mood. Dementia with Lewy bodies (DLB) is the second most common degenerative dementia in older people. Despite this, rates of misdiagnosis are high with many people receiving diagnoses of Alzheimer’s Disease, Parkinson’s Disease or delirium instead. Additionally, very little is known about the usual patterns of DLB in routine NHS care settings. Through anonymized, electronic clinical records of Cambridgeshire and Peterborough NHS Foundation Trust (CPFT), we identified a group of 251 individuals with DLB. From their clinical records, we examined information about their first consultation, diagnosis, symptoms and outcomes. We found that individuals with DLB present initially to secondary care with a wide range of symptoms and complaints, some of which are not immediately suggestive of a DLB diagnosis. Along with memory loss and hallucinations, the low mood was noted as a key presenting complaint among the DLB group. Rates of REM sleep disorder were considerably lower than would be expected from a DLB group. This study shows how useful electronic clinical records can be, allowing researchers to identify and examine in-depth the clinical course of a large group of individuals with DLB. By studying the presentation and course of this patient group in clinical practice, we can find ways to better identify patients with DLB earlier and improve patient care.